FRANCES BLACK's professional singing debut was in 1986, when she began performing with her three brothers and sister (Shay, Michael, Martin, Mary, Frances) as The Black Family, performing a mix of traditional and contemporary/traditional Irish music. With The Black Family, she did two major tours of Ireland in the late 1980s, and appears on both recorded albums [see discography]. In 1988, after recording the second Black Family album, Time For Touching Home, Frances joined the group Arcady as vocalist (with former De Dannan member Johnny McDonagh, and Brendan Larrissey, Patsy Broderick, Sean Keane, Cathal Hayden, Sharon Shannon, and Paul Doyle). While Frances was with Arcady, the group toured internationally - including Europe, Iraq and the U.S. - and recorded their debut album, After The Ball, containing a mixture of traditional tunes and vocals/songs. The single for the album's title track, the song After the Ball - on which Frances recorded vocals - went to #7. The album was #6 on the Irish charts and also successful in the U.S. folk market. This growing popularity of Arcady in the U.S. meant that Frances was increasingly spending more time touring overseas, and this conficted with the demands of a young family. It was at this point that Frances decided to leave Arcady. Her last tour with the group was to the U.S. in August of 1992. A short time after leaving Arcady in 1992, she began an association with Irish singer/songwriter Kieran Goss of Newry, County Down. They recorded one album Frances Black and Kieran Goss, and toured together. Also in 1992, two of her songs were included on the best-selling compilation of Irish women singers, A Woman's Heart. The biggest-selling Irish album ever, this album continued to hold a place on the Irish charts two years after its original release, and was approaching sales of 350,000 in 1995. Frances toured Ireland on the highly successful Woman's Heart Tour which, along with the album, effectively introduced her to a very wide audience and moved her career into a higher gear. In March l993, Frances toured Australia and New Zealand with some 20 other Irish musicians and artistes, as part of the Guinness Celebration of Irish Music Tour, and received rave reviews for her performances. In late February 1994, Frances released [in Ireland] her first single from her debut album. The song written by Christy Hennessey, All The Lies That You Told Me received huge airplay and reached no.3 in the lrish Singles Chart. The success of tbe single signalled the arrival of Frances as a major new talent. Released in Ireland in April of 1994 and in the US in 1995, Talk To Me is Frances' second album, and her first solo effort. The album contains 4 Nanci Griffith songs (which were unrecorded by Nanci at the time of Talk To Me's release): "On Grafton Street" , "Talk To Me While I'm Listening" , "Always Will" , and "Time of Inconvenience" ; Vince Gill's "Colder Than Winter" , and John Lennon's "Intuition" , as well as songs by Christie Hennessy, Donagh Long, and Mark Nevin (of Fairground Attraction). After release, Talk To Me went to #1 on the Irish charts, and remained there in the top 10-15 albums through the fall of 1994. This debut album has also been released in the U.S.A. by Atlantic on the Celtic Heartbeat label on 28th February 1995 and in the U.K. and Europe in May of 1995. In September 1994, the second compilation of Irish women artistes, A Woman's Heart 2, was released; it included two songs by Frances: Talk To Me While I'm Listening from the Talk To Me album, and a previously-unrecorded Mark Nevin song, Fear Is the Enemy of Love . During the fall of 1994, Frances toured the U.S. In March of 1995, Frances' second solo album, The Sky Road, was released in Ireland on the Dara label. During 1995, she toured Ireland and the UK in support of the album - and A Woman's Heart 2 . The Sky Road was released in the US on the Celtic Heartbeat label in 1997. 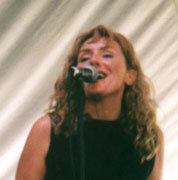 Frances' third solo recording, The Smile On Your Face, was released by Dara in 1997. It includes the Fear Is the Enemy of Love track with Eoghan and Aoife singing backing vocals, Stranger on the Shore from the Frances Black/Kieran Goss collaboration, White Dress , as well as a wonderful assortment of songs by Irish, English and American songwriters. In 1998, Frances released her fourth solo recording, Don't Get Me Wrong in the UK on Sony Entertainment (UK). She also toured the US with the Guiness Fleadhs in New York and Chicago. Don't Get Me Wrong has not been released in the U.S.
2001 brought the release of a compilation, The Best of Frances Black, again on Dara-Dolphin Records. This disc includes 16 tracks from Frances' recordings with Arcady and The Black Family, as well as her solo efforts. Frances is touring the U.S. with The Black Family. The reports of the excellence of her live shows coupled with the popularity of her albums have made Frances Black one of the leading new artists to emerge in Ireland in recent years. This site was created in 1995 as a tribute to Frances Black, her music and issues important to her. It is not officially associated with Frances. bio based on material provided by Brian Allen, Dara Records, Atlantic/Celtic Heartbeat, Dojo Internet Services, and various press coverage.